Friday night—a free event for the public—featured the men’s pole vault, men’s javelin throw and several men’s and women’s track events. 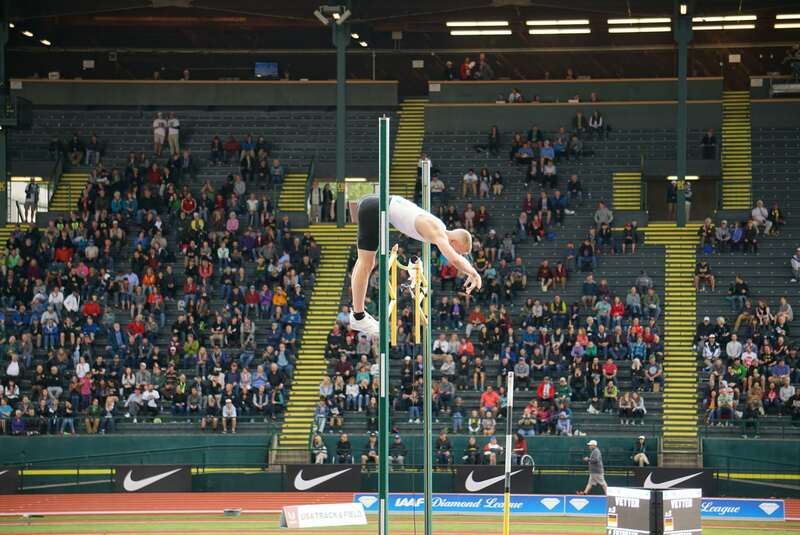 Combatting a challenging wind, Sam Kendricks (USA) took first place in the men’s pole vault with a clearance of 5.81m. The javelin competition saw the meet record surpassed four different times, with the crowd erupting after each soaring throw. Germany swept the field with Thomas Rohler throwing 89.88m to take first place, followed by his countrymen Johannes Vetter (second) and Andreas Hofmann (third). For the track events, the first women’s 800m race of the weekend ended in a 2:00.84 first-place finish by Natoya Goule (JAM), and the men’s 800m was taken by Emmanuel Korir (KEN) with a time of 1:45.16. The women’s national 1500m saw first- and second-place finishes by the youngest women in the field (both 21 years old): Dani Jones (first in 4:07.74) and Alexa Efraimson (second in 4:08.70). The evening wrapped up with the highly anticipated men’s two-mile run. Prior to the meet, 5,000m Olympic silver medalist Paul Chelimo (USA) stated his intention to break the American record of 8:07.07. 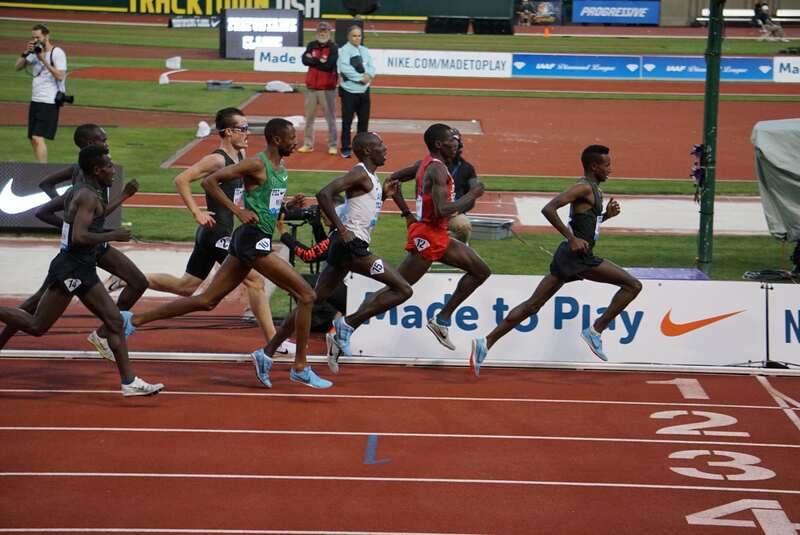 That didn’t come to pass as 18-year-old Selemon Barega (ETH) came out on top in 8:20.01, closely followed by Chelimo who finished in 8:20.91. Saturday’s afternoon program was packed with 16 total events for the sell-out Hayward Field crowd. Jennifer Schur (USA) claimed first place in the women’s pole vault with a 4.85m clearance, while Eliza McCartney (NZL) took second and American-record-holder Sandie Morris (USA) finished in third. On the track, rhythmic clapping accompanied the runners down the homestretch of each race. Hayward Field is known to draw the most knowledgeable fans in the world, and their enthusiasm was in full display. In the women’s 800m, a new meet record was set by winner Caster Semenya who finished easily ahead of the competition in 1:55.92, having not lost an 800m race since 2015. 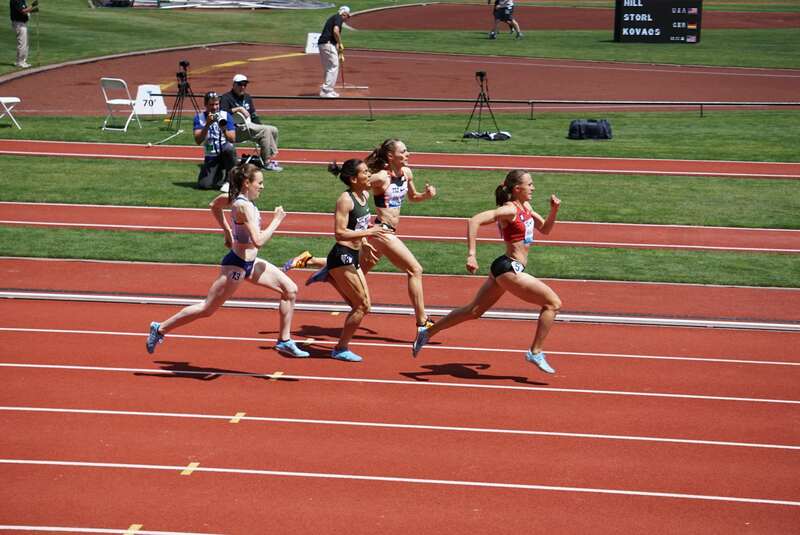 The women’s 1500m race was a thrilling event, with Jennie Simpson leading most of the race until Shelby Houlihan (USA) sprinted past her in the final straight to take the win, while Laura Muir (GBR) finished second. Other highlights include Ronnie Baker’s (USA) upset over Christian Coleman (USA) in the men’s 100m, with Baker finishing in 9.78 seconds. In the men’s shot put, Ryan Crouser (USA) showed incredible strength and agility in setting a new meet record of 22.53m. Also winning was two-time Olympic gold medalist Christian Taylor (USA) in the men’s triple jump (17.73m). Timothy Cheruiyot (KEN) took the men’s mile crown with a time of 3:49.87, and Genzebe Dibaba won the women’s 5,000m in 14.26:89. Click here to view the complete results from Saturday’s events. Unfortunately for Baker, the wind was at his back at a higher-than-legal speed, so the time isn’t officially recognized.